While residing at his retreat monastery, Garpa Ritroe, during his tender years, he followed basic training in reading, writing, memorization and other preliminary studies under the tutorship of several great scholars and practitioners. In the Water-Mouse year (1912) when he was ten years old, he enrolled at the Loseling College of Drepung Monastic University and began a rigorous training in the vast field of the Buddhist studies. In the first month of Water-Bull year (1913) he received the lay and monastic ordinations of Genyen and Getsul from, in Kyabje Ling Rinpoche’s own words, ‘the great Doctrine-Holder, Master and Omniscient Buddha, His Holiness, the Thirteenth Dalai Lama,’ in the Sasum Mangyal Chamber of the Potala Winter Palace. From the age of twelve, he received many discourses on all aspects of Sutra and Tantra teachings and tantric initiations from thirty great Lamas, including His Holiness the Thirteenth Dalai Lama, his root Guru, Kyabje Phabongkhapa Dechen Nyingpo, Kyabje Buldu Dorjechang, the Regent Kyabgon Sikyong Tadrag Dorjechang, Kyabje Khangsar Dorjechang, Chone Lama Rinpoche, Kyabje Yongdzin Trijang Dorjechang and many others. At the age of twenty-eight, while on an extensive pilgrimage in Tibet, he gave many discourses at various places. When His Holiness the Thirteenth Dalai Lama passed into the state of peace the Water-Bird year (1933), he participated in the preparations for the preservation of His Holiness’s body and consecration of his golden reliquary in the Potala palace for a period of two years. In the Fire-Mouse year (1936) at the age of thirty-four, he was appointed head Lama of Gyutoe, having previously served the term as gekyö (disciplinarian) with distinction. He was appointed abbot by the ruling Regent, Gyaltsab Radreng Hothogtu. It was during the second year of his term as abbot that he saw the golden face of His Holiness the Fourteenth Dalai Lama, who arrived in Lhasa from Domey Tzonkha, which was also the birthplace of the Jamgon Tzongkhapa. In the Iron-Dragon Year (1940) His Holiness the present Dalai Lama was enthroned upon the ‘Lion Throne.’ Having served as Assistant Tutor to His Holiness earlier, while abbot of Gyutoe, he was now appointed Junior Tutor. Thereafter, in 1949 he was appointed Sharpa Choeje, the second highest position in the Gelug Tradition next to Gaden Throneholder and subsequently became His Holiness’s Senior Tutor. Later in 1954, Kyabje Ling Rinpoche accompanied His Holiness on a state visit to China. Then in 1956 he accompanied His Holiness to India to celebrate the 2500th anniversary of Lord Buddha’s parinirvana. Upon his return from these journeys, as on many previous occasions, he gave considerable teachings on sutra and tantra and initiations both publicly and privately to thousands of disciples, thus sharing the lineage of these teachings, which he had received from his own masters, solely for the benefit of others. Then in the Earth-Pig Year (1959) the Communist Chinese invaded Tibet. This posed a serious threat to His Holiness’s life, which is the sole source of happiness for Tibetans at large and the world in general. For the sake of protecting the Buddhadharma and Tibet’s independence, His Holiness sought political asylum in India, Tibet’s neighbour and great friend from ancient times. Both the tutors, Kyabje Yongdzin Ling Rinpoche and Kyabje Yongdzin Trijang Rinpoche also came to India in His Holiness’ entourage and resided with him, first at Mussoorie and later in Dharamsala, which became the headquarters of the Tibetan Government-in-Exile in 1960. Following the death of the Ninety-sixth Gaden Throneholder in Tibet under Chinese oppression, Kyabje Ling Dorjechang was promoted from his position as Sharpa Choeje and appointed Ninety-seventh Gaden Throneholder. On March 6th 1065, in the Wood-Snake year when he was sixty-three, he ascended to the Gaden Throne at the most auspicious and holiest of places, Bodhgaya, also becoming abbot of Gaden Phelgye Ling Tibetan Monastery in Bodhgaya. Back in India in 1969, Kyabje Ling Dorjechang gave an extensive discourse on Je Tzongkhapa’s treatise on the Graduated Path to Enlightenment, for a period of one and a half months. This discourse was given at Bodhgaya, in the assembly hall of the Tibetan monastery, to about seven hundred disciples. In Dharamsala, at his private residence, Chopra House, graciously provided by the Government of India, Kyabje Ling Dorjechang has dedicated himself to restoring the waning teachings of the Buddha, and of the Second Buddha, Jamgon Tzongkhapa’s stainless views on Sutra and Tantra, and their pure traditions of practice. At the request of many Tibetans and the growing number of his Indian and Western disciples he gave many expositions of the major subjects of Sutrayana and initiations, oral transmissions and explanations on the Yogic systems of the four classes of Tantra. He often gave novice and Bhikshu ordinations as well. 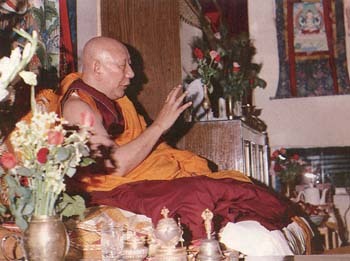 His last public teachings included an extensive discourse on the Lam-rim Chen mo, the Graduated Path to Enlightenment, given in Bylakuppe to a gathering of nearly two thousand at the request of Sera monastery and a five day exposition of the Four Mindfulnesses at Tibet House, New Delhi, to a group of over one hundred Indian, Western and Tibetan disciples, which was concluded by a permission of Avalokiteshvara and a long life initiation. In this way he kindly stayed among us to guide all beings without exception to his own state of attainment. Then, to the shock and despair of every one, he had a serious stroke in September 1983. The abbots and heads of the major Gelug monasteries and many individuals immediately came to Dharamsala from all over India and abroad to offer dedicated prayers for his long life. Despite all possible treatments, at the conclusion of his eighty-first year on December 25th just before noon, he passed into the state of peace for the benefit of the beings who cling to the views of permanence. It so happened that at that moment all his personal attendants were in the room with him and with his last breath he smiled. He then remained in the absorption of the clear light state until January 7th, his body staying in perfect condition. Sounds of celestial music and the melodious chanting of male and female voices were heard from the room where his body lay alone in state during the absorption of the clear light. Thereafter, his attendants knocked softly on the door before entering the room. Many groups and individuals came to pay their respects and, in deepest gratitude for his ineffable compassionate deeds, offerings were made extensively. Then. in accordance with the divination of His Holiness the Dalai Lama, procedures were initiated for the preservation of his body. immediately following the departure of his enlightened consciousness on January 7th. It was decided to employ the ancient Tibetan method. After the ritual purification and bathing of his body, various minerals, liquids and medicinal substances were used in accordance with his own writings on the method of preservation. recorded when he received clarifications on this form his root Guru Kyabje Phabongkha in Tibet. Despite the serious nature of his illness, he took advantage of this situation to demonstrate various aspects of dharma. giving his disciples a unique opportunity to intensely appreciate his rare qualities and accumulate vast merit. Also to lessen the shock to his immediate attendants and disciples he underwent the conventional stages of the illness for four months with complete composure and dignity, compassionately preparing them for the inevitable. During the period of his illness. His Holiness the Dalai Lama paid repeated visits to him requesting his continued presence and giving strength and wisdom to those around him. 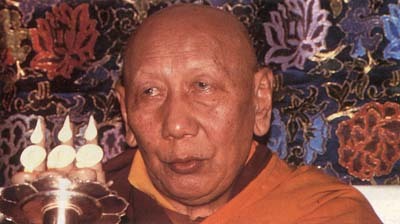 On December 22nd, 1983 during an introductory discourse, His Holiness told the large audience of Tibetan and Western disciples that considering the condition of Kyabje Rinpoche, whom he had visited with that very morning, this would be the last initiation of Vajrabhairava he would give during the lifetime of the Lama from whom he had received this particular lineage. 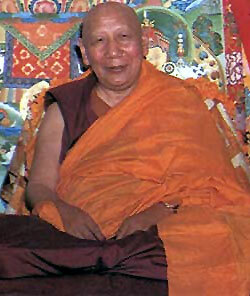 He consoled the grief-stricken audience, saying that this was not a cause for sorrow, for the purpose of a Lama is that one may receive teachings from him and His Holiness stated that with a few minor exceptions, he had received all of Kyabje Ling Dorjechang’s teachings fully and thoroughly. His Holiness implemented this advice by giving the initiation with supreme assurance, occasionally sharing a laugh with the assembled disciples. He further emphasized that the best way of repaying the Lama’s kindness would be to put his teaching into practice to actualise one’s devotion. As a conclusion to the initiation His Holiness made a special offering of tsog to Vajrabhairava and asked the assembly to dedicate the merit for the perpetual accomplishment of the wishes of this great Lama. Although we lack the good fortune to benefit from his direct presence now, his compassion and wisdom are not restrained within any limits. If we put into daily applications the teachings and advice that he so compassionately gave, both publicly and privately, and if we pay closer heed to the same advice from our living lamas. this is the proper and only way of repaying his immeasurable kindness and of receiving his blessings and guidance until his return in his next human incarnation. Only in this way will we fulfil the purpose of our devotion to respectfully requested His Holiness the Dalai Lama to compose a prayer to appeal for his swift return. In the words of the Prayer we fully share the gratitude and the deep sentiments His Holiness has expressed and fervently long for and request a prompt incarnation of our most highly respected and beloved Lama. May our dedicated prayers be accomplished soon.